This magnificent antique Victorian sterling silver spirit kettle has a large bulbous shaped form. The upper, bulbous portion of the kettle is embellished with exceptional chased floral sprays accented with scrolling borders, all on a matte background; the lower portion is plain. The decoration to this Victorian kettle incorporates a large scroll bordered fruit and floral design to either side. The back of the body is embellished with an impressive contemporary bright cut engraved crest depicting a saltire between, in chief a mullet and in base a matlet, above the motto Non Sine Periculo - Not without danger and below the crest of a swan*. This antique silver kettle is fitted with a hinged hallmarked cover encircled with further chased floral decoration with a scrolling border to the shaped rim. The cover is surmounted with the exceptional and original hallmarked, sterling silver finial modelled in the form of a stemmed floral design with shaped leaf ornamentation to the base, securing to the interior with the original hallmarked screw fitment. 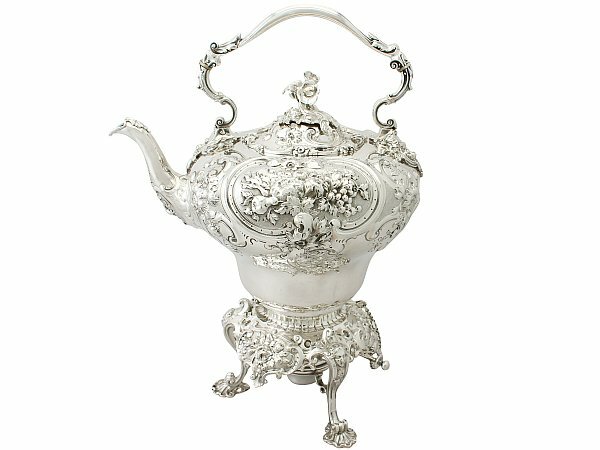 This fine and large example of antique teaware is fitted with an impressive hallmarked sterling silver scrolling handle ornamented with impressive chased decorated leaf and scroll decorated terminals in junction with the body. 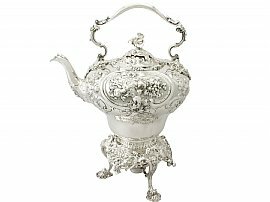 The magnificent kettle detaches from the original hallmarked cast sterling silver stand, supported by three impressive scrolling legs accented with figural mask ornamentation. The upper portion of the stand is embellished with impressive scroll bordered floral sprays, reflecting the same style to that of the body. The stand incorporates a plain scrolling frame which retains the original hallmarked detachable spirit burner accented with a hallmarked hinged snuffer. This exceptional spirit kettle was crafted by the notable and collectable silversmith John Samuel Hunt and bears the retailer's mark 'Hunt & Roskell, Late Storr & Mortimer' to the underside of the kettle. This magnificent piece of Victorian silverware is the finest of its type you could hope to acquire. This crest and coat of arms pertains to the Freer family; George Freer Esq of Glasgow, Scotland. This antique Victorian silver spirit kettle is a superior gauge of silver for its type, exceptional quality and in exceptional condition. Full hallmarks struck to the underside of the kettle and spirit burner, and part hallmarks to the stand, kettle handle, cover, finial and screw are all very clear. Height to top of handle 42cm/16.5"
Length from back of body to tip of spout 31.5cm/12.4"